Over the years of working till late nights and constant application of makeup, I must admit that these have taken a toll on my skin. Behind the camera, my skin has large pores issue and is lacking the natural glow that I always wanted. Hence, that explains why I am here at Ceramiracle today -- to seek for some professional help from the beauty experts. Ceramiracle, founded by Eugene He, is the home for Beverly Hills-styled medifacial treatment originated from Santa Monica, California. It takes pride in having products which fit for every type of skin regardless of age, skin type and skin tone, holding tight to their tagline, Prejudice-Free Beauty. While the brand has strong presence in United States, Singapore and Hong Kong, we are lucky to have Ceramiracle's very first Malaysia flagship beauty concept store here in TTDI. Ceramiracle is highly recognised globally and featured in various international media. Customers can also continue the Beverly Hills-styled beauty regimen at home using Ceramiracle's revolutionary products which are botanical-powered and PETA certified (cruelty-free) in the process of creating the award-winning formulas. Don't worry, all Ceramiracle products do not contain harmful chemicals, artificial preservatives or fragrance. During my virgin visit at Ceramiracle, I am served with a warm welcome drink -- First Light Signature Tea, an ultimate collagen-boosting beauty tea inspired by Ceramiracle's First Light range of products. Thanks to the combination of jiaogulan, rose, licorice and chrysanthemum, the floral scent is amazing and it leaves a natural sweet note on the mouth. Don't worry if you are not a fan of floral flavours. The Ageless Cafe also serves over 20 beauty-inspired organic tea blends and delicious cakes. I love their idea of serving healthy brews to educate us on how our diet can give us a skin makeover. Sipping on the luxurious brew while waiting for my treatment is probably the best thing to do on such a relaxing Sunday afternoon. Oh, did I forget to mention that there is a quick skin health check prior to the treatment? It is good to have the staff understanding my skin condition and giving my skin the best to tackle the issues. Then I head to one of the treatment rooms labelled "Santa Monica" for the signature The Celebrity Medifacial. It uses the latest Beverly Hills inspired technology and products to treat, firm, smooth, brighten and hydrate the face in just 80 minutes. ❤ Just 80 minutes of pure bliss. ❤ No downtime, no pain and no extractions. ❤ Help restore our youthful beauty in just one session. Unlike many aesthetics clinic that spoil us with options which may or may not suit our skin, Ceramiracle saves us the hassle by offering only one treatment in The Aesthetics Salon that suits all skin types, age groups, genders and ethnicity. 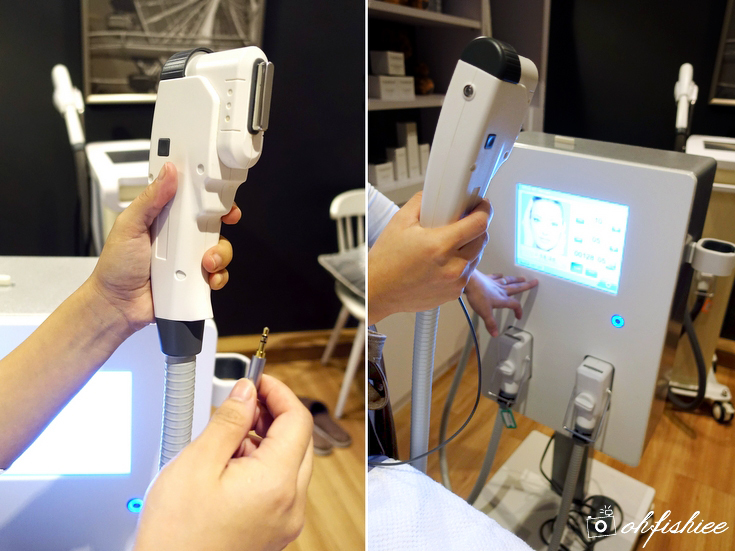 Inspired by a day out in Santa Monica, the Celebrity Medifacial treatment starts with multiple steps of cleansing the face to get rid of the makeup residues, impurities, dead skin cells etc. It features ultrasonic waves that penetrate deep and cleanse the skin more effective. The Reboot Mask is an additional step, not covered in the standard medifacial package, which is specially applied for better exfoliation. It is a skin softening nutrient-rich clay mask containing ceramides and 25% BFE (BioFerment Essence) that gently lifts away dead skin cells and resets the skin to its original best state. The result? It smooths, softens and conditions the skin with just one step. I am tempted to get a bottle of this for home use! to prep the skin for the next step. A lot of people thought it is laser treatment, but no, it is not. Intense Pulsed Light (IPL) is a non-laser therapy that involves shining highly concentrated and intense pulses of light on the skin. Unlike laser, it is safer and more effective with little or no skin damage. Plus, IPL works very well on age spots, most brown pigmentation, redness, wrinkles etc while improving skin texture and a dull complexion. I am surprised that the result can be seen within minutes! It is a non-surgical step to "reshape the skin surface" by lifting and toning the contours of the face in waves. Step 6: 3-minute beauty mask to calm and soothe the skin. It is so comfortable that I fall asleep soundly in the treatment room! After the mask, a thin layer of First Light Serum is applied onto the skin to instantly hydrate and rejuvenate the skin while it also helps diminish appearance of lines and wrinkles. Being one of the bestsellers in Ceramiracle, it is an all-in-one product to replace your regular moisturizer, serum and essence. How convenient! The final step is a super cooling and relaxing, non-invasive treatment to decrease pore size and wrinkles resulting in clearer, smoother and tighter skin almost immediately. It feels freezing cold on the face! But with the rolling motion, I find it pretty comfortable after a while. The result? I am impressed! For my current large pore condition, it would take several sessions to minimise the pore appearance. But hopefully I wouldn't need to wait too long. If there is one secret to stay young always, it would be The Celebrity Medifacial. 1. I love the overall comfortable process of Ceramiracle's Beverly Hills-styled medifacial that allows me to sleep like a baby and then wake up with rejuvenated, baby-soft skin! 2. Less worries with guaranteed result - Quick, effective and most importantly, safe for all skin types and all ages. 3. Highly recommended for those who want to restore the baby-soft-and-smooth skin, and reverse aging. 4. Revisit? Yes! 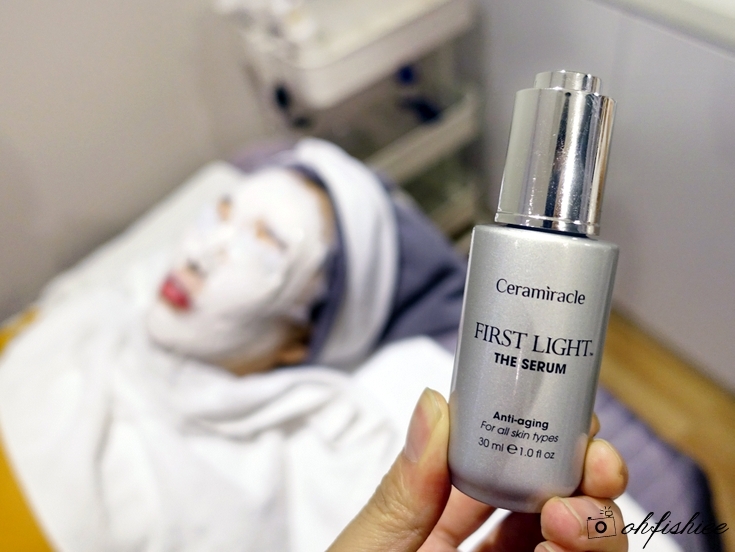 Definitely for the overall experience with the medifacial (and beauty therapist) as well as the award-winning products including the global cult-favorite First Light The Serum and The Reboot Mask.